14kt white with ceylon blue sapp,0.5950 ct of diamonds. Add volumes of feminine flair with this twinkling design. A stunning sight to behold, this ring is crafted in polished 14K white gold. 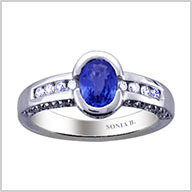 The center glows with one oval cut 7 x 5mm ceylon sapphire stone in a bezel setting. The lavish design unfolds with 44 full round cut diamonds in chanel and bead settings at the outside. The ceylon sapphire weight is approximately 0.9200ct and the total diamond weight is 0.5950ct (both approximate). The setting size is 2/8"x 3/8"with a height of 3/16".